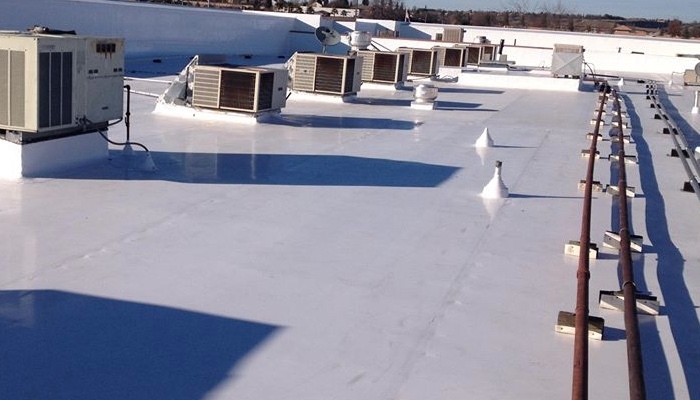 A commercial flat roof is the best roofing system for a very large size commercial property. Installing a sloped or pitched roof on such a building doesn’t work as well, because it will be considerably more difficult and expensive. It will also require you to employ special engineering teams to account for the additional structural weight, as well as configuring rooftop heating and cooling systems and proper drainage configurations. Flat roofs are very utilitarian as they it can be used as a deck, green roof with vegetation, or an expansive patio. Ecological enthusiasts love the use of green roofs, because of the use of vegetation. An extra benefit of a green roof is that it will improve the city’s air quality and reduces the heat island effect in large urban communities. If you are thinking of installing a green roof, it is best to use 80 mil or thicker PVC or TPO membrane, because hot-air welded seams will make sure the roof will not leak underneath the soil and plants. Another advantage to a commercial flat roofing system is that it works great when large HVAC equipment needs to be utilized in and on top of your building. It can go straight up on the rooftop, instead of having to be installed on the ground, creating an unsightly array of equipment and machinery. Lastly, flat roofs work well for large-scale solar PV installations, as they are not usually shaded, providing very strong sun exposure throughout the day. TPO and PVC are both highly reflective, putting up to 90% of the heat back into the atmosphere, meaning that one of these materials can help you save many hundreds of dollars on your utility bills. Both are Energy Star Rated for their cool properties. One thing to make note of, however, is that white color roof coatings and materials do collect a lot of dirt and dust over their lifetime. As time goes by, this will decreas their energy efficiency. They still will be highly reflective, however. Consistent, routine maintenance schedules will help prolong the maximum energy efficiency of your white membrane materials. Recently, a lot of darker colored membranes have been created to also have light-reflective properties and offer energy savings. You should note the manufacturer’s specifications on a particular brand to view its efficiency efficiency ratings. Modified Bitumen and EPDM have the lowest energy efficiency rating. Because they are darker in color, they can warm up to as high as 170 degrees in the hot summer months, which will make your HVAC system work harder and ratchet up your energy bills. Two materials that are 100% recyclable are TPO and PVC. Old membranes can be recycled back into making brand new materials at the end of their lifespans after being removed from an older roof. You can also eliminate tear-off waste by installing PVC over an old roof during installation, which will cut your expenses and save on your community’s landfill space. EPDM, Tar & Gravel, and Modified Bitumen are not eco-friendly, however. All of these materials cannot be recycled, because they are constructed from petroleum based by-products. Because of this, you will have no choice other than disposing of them, after removal, in a landfill. PVC is the material with the longest lifespan. Because of its heat-welded seams, it stays flexible throughout its use and can also weather thermal movement and shifting. 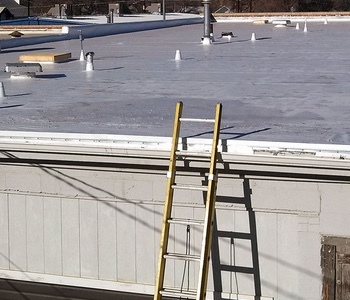 A PVC flat roofing system is able to last as long as 30 years or more. Manufactures usually include a 25 year warranty for commercial installations. EPDM will last much less, usually about 10-15 years. Even though some manufacturers offer a warranty that are up to 40 years long for some commercial roofing applications, you need to remember that these warranties don’t cover seams that fail or issues caused by ponding water. These are the two main causes of problems and deterioration of rubber membranes. How long a TPO roofing system lasts will vary due to factors with the membrane’s manufacturing process. As of today, they will range from 7to 10 on the low end 20 years on the high end. The manufacturer warranty is usually up to 20 years for commercial TPO installations. Keep in mind that warranties offered on different kinds of single ply membranes can vary a lot depending on the membrane’s thickness, size, how it was installed, and the environmental elements. You should do your due diligence, carefully read and compare the warranties for the varied materials and systems you are thinking about. Tar & gravel, along with modified bitumen roofing systems can last between 10 and 20 years, but they’re very expensive to remove at the end of their lifespans. How long they last can depend greatly on the experience of the installing commercial roofing contractor, because there aren’t many commercial roofers still around who actually know how to work with this material. If you have one of these types of roof and it needs to be repaired, you’ll want to make sure you’re contacting an experienced pro who that has a history with it; someone who’s specialty is just single membrane systems will probably not be your best choice. Here at Armadillo Roofing & Exteriors, (512) 333-7663, we provide commercial flat roof repair and commercial flat roof installation and replacement services to Temple, Texas and the surrounding area communities. We’ve been been providing these services to the area for over 15 years. When you need a seasoned pro to help you with your commercial flat roofing questions, give us a call.